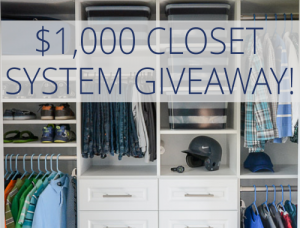 Do you love home tours as much as I do? 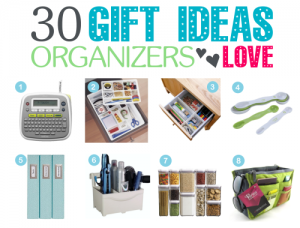 I just love gleaning ideas and inspiration from others. 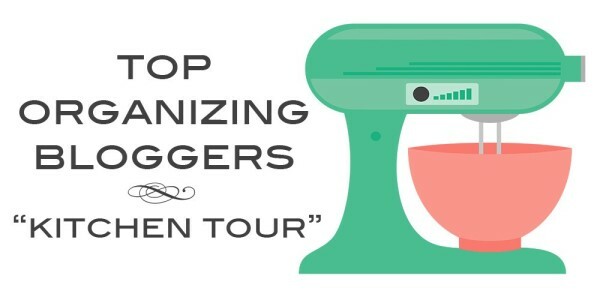 Today, the Top Organizing Bloggers have teamed up to bring you the Organized Kitchens Home Tour. We’ll each be sharing a space in our kitchens to inspire you! Today, I’ll be sharing my kitchen command center. 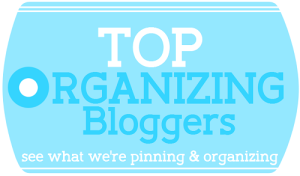 Check out the links to the other blogs at the end of this post. 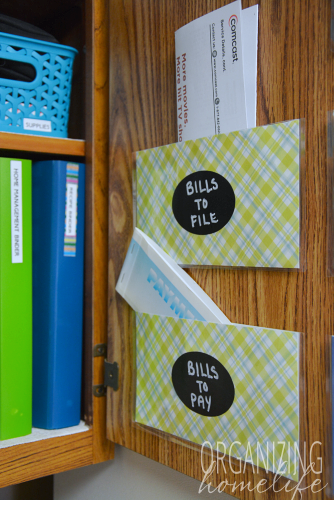 About two years ago, I came across the idea of storing important paperwork in a kitchen cabinet. Actually, the idea wasn’t totally new to me since my mother-in-law had been keeping notes, pending papers, and phone books in her kitchen cabinet for years, but somehow it didn’t really click for me at the time. 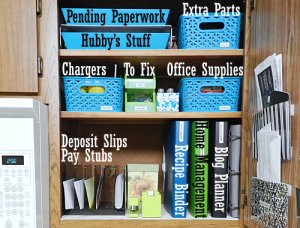 When I saw the idea two years ago, I loved it and wanted to implement it in my own kitchen, but didn’t think I had a cabinet to spare. I decided to rearrange some things and was able to find the space. Let me just state this as clearly as I can: this has been one of the single most helpful things I have ever done in managing my home. Does a command center have to be in the kitchen? No. I use a cabinet in my kitchen, because the kitchen is centrally located and we tend to spend a lot of time there. 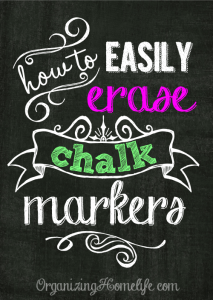 You could use a nearby bookcase, shelf, corner nook, or even just create a space on the wall! 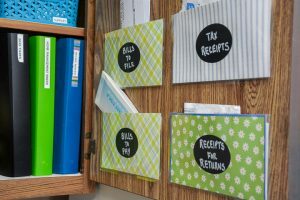 The idea is the same: create a space where you can deal with important paperwork immediately – preventing you from creating “temporary” piles that can too easily turn into “permanent” piles. My command center is also a perfect spot for a “mini office”. 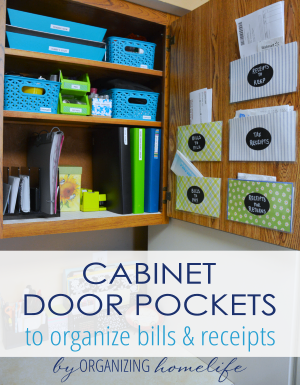 My favorite part of my command center is the inside of the cabinet door where I created these door pockets with scrapbook paper and a laminator. See how I made them here. 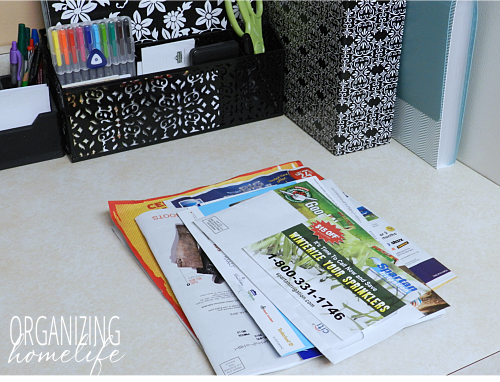 When mail comes in, I immediately trash or recycle the junk mail, and put the bills in the “bills to be paid” pocket. That way bills never get lost in a pile of mail. 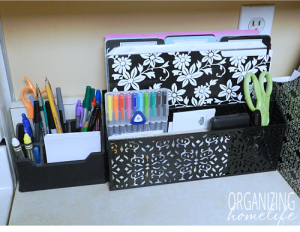 When I am ready to pay bills, I take them from the pocket and file them in my bill organizer. If it’s a one time bill that I need to file in my filing cabinet, I put it in the “bills to file” pocket. 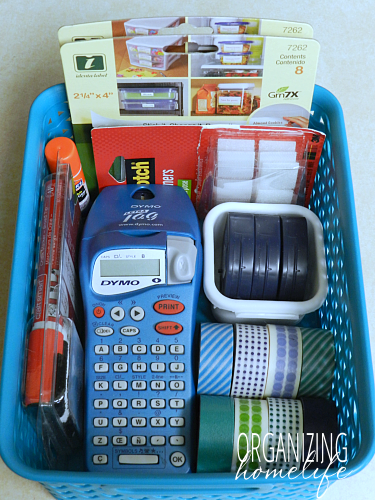 Then, when I get a chance I can easily file those. See more details on what I keep in my command center here and here. 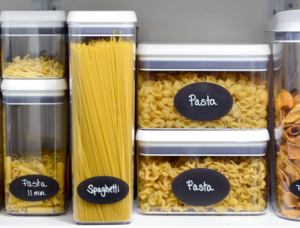 You can also check out my series on How to Organize Your Kitchen Frugally in 31 Days here. I love your kitchen command center. You were able to fit everything perfectly into that cabinet and on the counter top. SO many smart ideas! 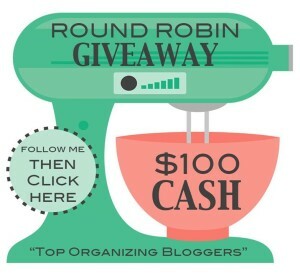 Hi Ginny, really nice tips! 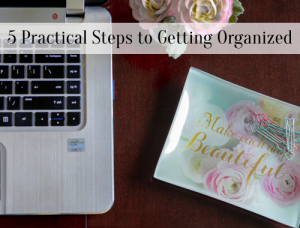 I throw all my mail on the kitchen table, so I guess it’s time for me to get organized. Btw, I’ve signed up to your giveaway last night. Thanks for your tips I really like to do some of them in my kitchen. I’m just having trouble when to start because I’m working almost the whole day and I’m just tired whenever I get home. 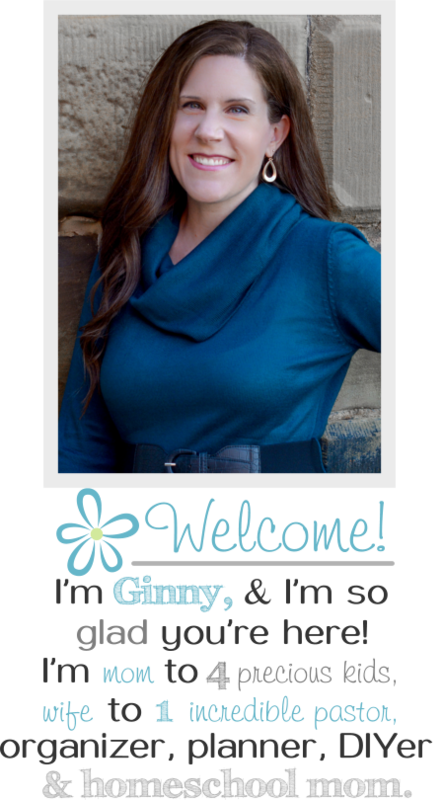 Thanks for your few awesome tips Ginny! Your kitchen command center is really cool. 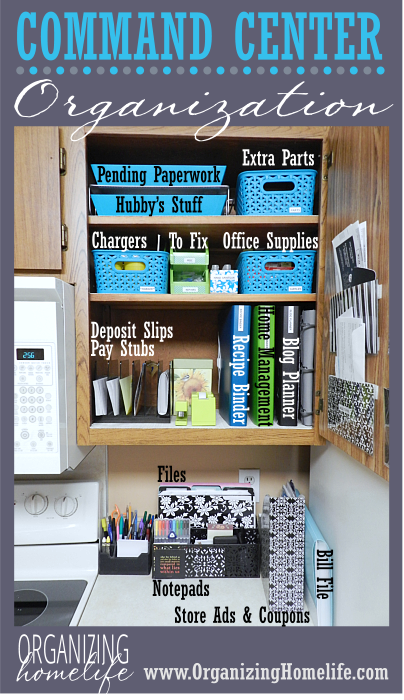 It’s really easy to maintain few important tasks with this type of kitchen command center. 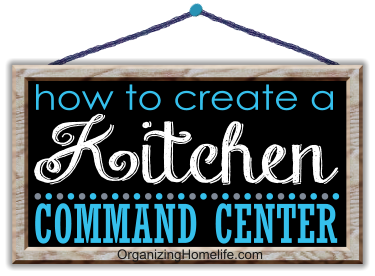 Valuable post about kitchen command center. 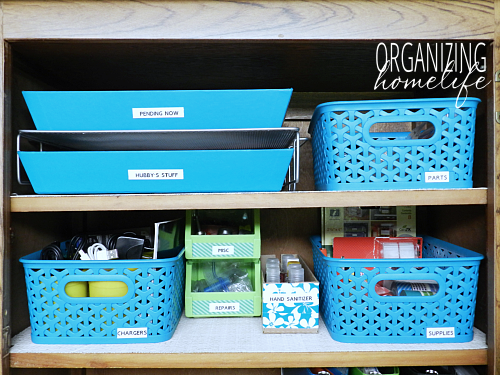 I think your organizing technique is fantastic and I follow this style. Door pocket looks like awesome.Thanks for your great sharing.